The parish of South Wooton is situated in the west of Norfolk. It lies north of King’s Lynn, west of Castle Rising and south of North Wootton. The name Wootton derives from the Old English phrase meaning ‘settlement in the woods’. The parish has a long history and was certainly well established by the time of the Norman Conquest with its population, land ownership and productive resources detailed in the Domesday Book of 1086. This document states that before 1066 a freeman called Godwin held the parish, but that by 1086 the lands were held for the King by Godric. Numerous resources were also mentioned including a large number of sheep and some twenty salt-houses. The earliest sites in the parish are represented by scatters of prehistoric pot boilers (NHER 3341, 25005) discovered by fieldwalking. These sites accompany a wealthy of prehistoric finds that include Palaeolithic stone handaxes (NHER 14416, 14428 and 28093), a possible Mesolithic flint core (NHER 3313), Neolithic flint arrowheads (NHER 3282 and 14959) and a Neolithic flint fabricator (NHER 3281) that was used to produce flint blades. The number of prehistoric artefacts on record suggests that the landscape was heavily utilised during the period. There are rather fewer sites and finds dating to the Bronze and Iron Age. A possible Bronze Age barrow (NHER 13900) was identified in 1974, but a subsequent visit in 1977 found that the location was occupied by a residential housing estate. A single Early Bronze Age flint arrowhead (NHER 3336) has been found along Hillington Road. The only find dating to the Iron Age was a second century Greek silver coin (NHER 3314) allegedly found behind the 'Black Cabin'. The Roman period in South Wootton is very sparsely documented. Only a few mundane finds have been reported, and these include pottery sherds (NHER 11343), tegulae (NHER 19715) and a couple of coins – one of which was from the reign of Constantine I (NHER 28387). 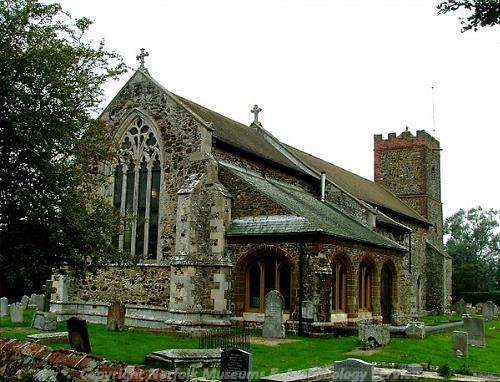 The earliest building still standing in the parish is St Mary’s Church (NHER 3295). This church has Late Saxon origins, with a number of fossilised quoins and blocks of conglomerate surviving as evidence of this early foundation date. Of course, much of the current fabric is of medieval or Victorian date, with the tower being an 18th/19th century addition. Inside, there is a stupendous Norman font carved with fearsome masks and a wonderful 17th century bier. The only other indications of a Saxon presence in the parish is a set of ditches, pits and post holes recorded in Nursery Close (NHER 12946), a paste bead (NHER 3286) and a scatter of pottery sherds (e.g. NHER 19715). It is also worth noting that a Macedonian coin, contemporary with the Saxon period but not of Saxon origin, has also been recovered from an allotment in South Wootton (NHER 34087). It is clear that during the medieval period there was heavy exploitation of the environment. Extensive aerial photograph of the area has identified a huge number of medieval saltern mounds (e.g. NHERs 27095, 27122 and 27925) in the parish. These salterns would have been used by the inhabitants to extract salt from salt water or brine. This salt would then have been sold, as it constituted a valuable trade commodity during this period. A medieval ironworking site (NHER 11343) has been identified to the south of Sylvan House on Nursery Lane. Along with iron smelting debris and domestic refuse, numerous pottery wasters were recorded and these suggest that clamp kilns might have once stood here. However, it is hard to tell whether these kilns were contemporary with the ironworking. Excavations to the west of the pump house on Nursery Lane also uncovered the foundations of brick buildings (NHER 3292). These could well have been late medieval shipping warehouses used to export the agricultural produce of South Wootton. The majority of medieval objects from South Wootton take the form of pottery sherds. Many of these were found by systematic fieldwalking during the 1980s (e.g. NHER 24117). However, the most interesting ceramic find was recovered from a garden of a property on The Green. Here, half of a possible Blackborough End type bowl (NHER 18628) was found along with other assorted medieval wares. Other medieval finds comprise roof tiles (NHER 19715 and 36557) and a penny of Alexander III of Scotland (NHER 25503). The records relating to post medieval South Wootton suggest that the parish continued to rely on agriculture for income. Aerial photographs show a number of post medieval field systems (NHER 27107 and 27860) as well as sea defences (NHER 27078 and 27134) intended to prevent the flooding of the farmland and urban area. The discovery of a waster mound of bricks and tiles (NHER 14467) at a site located in the heart of Ennerdale Drive, suggest that the parish also had a fully functional brickworks/tile works during this period. There is evidence to suggest that two of the medieval saltern mounds were converted into fortifications during the post medieval era (NHER 13784 and 31431). These fortifications may have been necessary during the English Civil War or at the time of the Spanish Armada. Such forts would have protected the approach up the River Ouse. Readers might be interested to know that cannons have been found at one of these forts (NHER 13784). During the latter part of the period the King's Lynn to Hunstanton railway (NHER 13591) ran through the parish. This opened in 1862 and closed in 1969. The entire railway track has been removed since 1969, although many buildings survive including a station at North Wootton. Intriguingly, an ingenious resident has also converted a railway carriage belonging to the Great Eastern Railway into a house (NHER 25687). Unlike other parishes, there seems not to have been a great spate of building in South Wootton at this time. However, the Old Hall was constructed in 1665, with a possible earlier core, and was built using carrstone with brick dressings. The Hall is notable for its several large chimneystacks, which survived the 20th century restorations. The most recent archaeological records concern World War Two/Cold War structures. One such building is a bunker situated beneath Woodlands old people's home (NHER 37607). It was built during World War Two but served as a nuclear bunker for the local seat of government during the Cold War period. In addition, aerial photographs taken in 1966 show a pair of wrecked boats in the river (NHER 27018). The vessels appeared to be barges and may have been used for dredging or in conjunction with earth moving for sea bank construction. Equally they may have been ex-military landing craft and utilised as practice targets by the military during World War Two. Thomas Sunley (NLA) 7 June 2007.